This really depends on the nanny. Some nannies are more than happy to help you out around the house, as long as it does not interfere with caring for the children. Other nannies are adamant about not doing any housework. You will need to ask the nanny during her interview how she feels about this subject. You will also want to ask her references the same question. 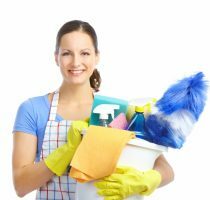 Many nannies will tell you that they don’t mind just to get the job, but you will soon find out that the chores are either not being done or are getting done with little effort. If you are looking for a “housekeeper/nanny” make sure you are straightforward in your ads and during the interview. Nannies get very upset when they are hired to be a nanny and are then given a laundry list of housekeeping duties. Make sure you go over exactly what type of housekeeping you need since you may have different ideas about what heavy or light housekeeping entails. You will also want to be clear on how much cooking and laundry is needed. Most nannies will agree to do all housekeeping that is directly related to the children, so children’s laundry, tidying up their rooms, meals, dishes and clean up of play areas and the kitchen after eating. With that said, it is still important to speak with your nanny about how she feels about these duties. There are nannies that will do both nanny and housekeeping but they usually are more expensive and will only do the cleaning when the children are down for naps or during a separate time that is agreed upon by the parents. Be sure not to put too much on your nanny’s plate since it may compromise your children’s care.